The Recession Special. Buck Fifty Pig Face. Now That's Face Value! Sam Woo Bar B Que. Van Nuys, CA. It’s almost cliché. The hunter so obsessed with his prey that he longs to become it, to be in the skin of the hunted. It’s not enough to stalk it, to kill it; this obsession craves more. There’s now an irresistible need to know it from within its soul, from the inside out — this omnivore’s dementia. Like the Plains Apache hunting bison while camouflaged with the hide of a dead one, assuming the guise of his prey puts the hunter into a deeper level. The kill is intoxicating but there’s a connection that brings with it sorrow. He wants to cry. It’s a bond that inspires daydreams of what the life of this creature was like before its life was extinguished. He ponders the animal like someone he once knew. Unlike the rest of his tribe, he devours the animal’s face. There is no apprehension when he tears off a cheek, no prickle of disgust when his lips brush against its snout and snot, not a cringe when he scoops out an eye with his finger. He crunches on the brittle ear — ironically, the noisiest part of its face. The face is deceptively plentiful with flesh. He found himself satiated even while a good portion of the visage remained uneaten. For the entire meal, he had come face to face, in the most literal sense, with his food. It wasn’t an anonymous hunk of meat. It had a life, a tribe, a moment on Earth. Now it’s become part of the hunter. And the hunter, at least for a brief time, had become part of the beast. Watch the Pig Face Show. Recession Special from eric alba on Vimeo. haha hilarious man. nothing like nice pigface to whet the appetite. The hunter and the hunted... Love the photo! Excellent post. That read like something out of "Lonesome Dove." 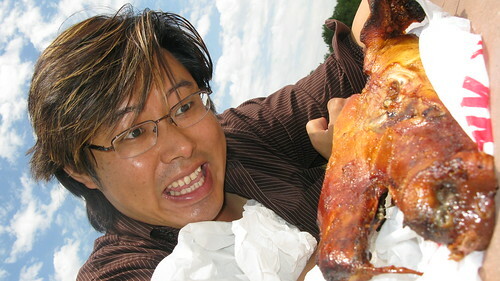 Considering you were eating pig (easily the most delicious animal), it's easy to imagine devouring the entire head. Well, maybe not the eyes. yes, nothing like pigface to whet the appetite, and nothing like pig bung to wash it down with. yum. "Lonesome Dove." I'll take that. It won a Pulitzer. Not too shabby. Eyes are delish. The window to the soul, y'know. Pig head is good stuff. The cheeks are so the best part. Yep, I've lost weight...but I think it's going to find its way back soon. Sam Woo.....that was our favorite Place to have Chinese food when we lived in Vegas. Miss that place up here in Calgary.